Since blogging an hour ago that Ken Livingstone would this week make a statement on the Dow Chemical/Olympics/Bhopal issue, his team have sent me the following statement that he will issue tomorrow. 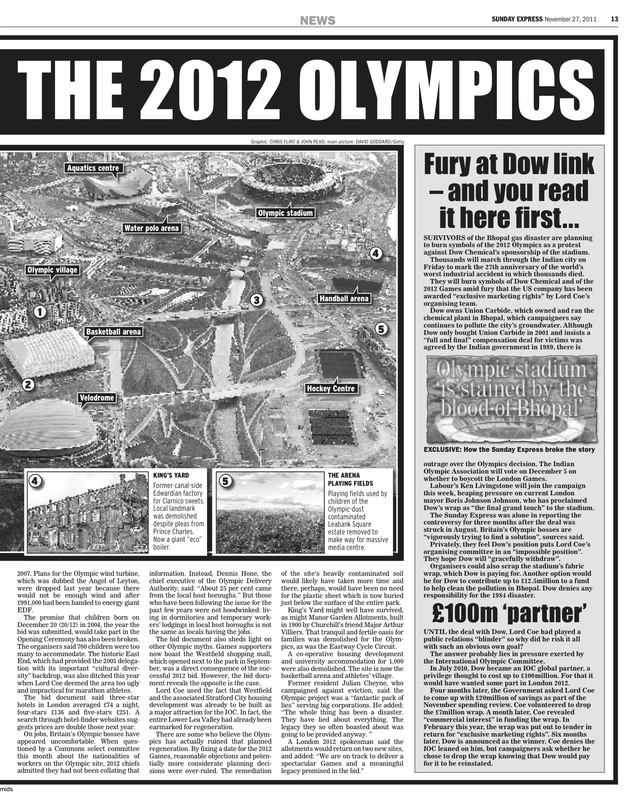 I am opposed that Dow Chemicals being a signature sponsor of the Olympic Stadium. Water supplies in Bhopalare still contaminated as a result of their wholly owned subsidiary’s activities – meaning that children in affected areas are born damaged at a rate ten times higher than in other parts of India. Dow has a moral responsibility to act to clean up the mess that the Union Carbide disaster left. Dealing with industrial contamination was the first necessary task to transform the Olympic Park from a derelict polluted wasteland into the largest urban park in Europe. It would undermine London 2012 to take money from a sponsor that refused to clean up its own subsidiary’s mess. Last week’s announcement that the Indian Olympic Authority is voting on whether or not to boycott the London Games shows the strength of feeling that exists on this issue. It can go as far as creating a potential crisis of legitimacy for the Games. Bearing this in mind, do we really need to accept £7 million from Dow Chemicals so that they can rehabilitate themselves and destroy London’s reputation in the process? Our objective should be an Olympics that is good for London, not a them-and-us Games. The soul of the London Games is worth much more than 0.08% of its budget. It is not too late to prevent the damage. LOCOG and the Mayor should admit that they have made a mistake. If they can’t find another private sponsor from the other bids that they had on the table, they should use a tiny fraction of the ODA’s under-spend to pay for the stadium wrap. It would be far better to do this than to allow Dow Chemicals to exploit an opportunity that has been paid for by people in London and across the whole country. Our thoughts should be with the victims of the Bhopal Union Carbide disaster. The Mayor and LOCOG must pull back from the brink and not risk damaging the London Olympics’ reputation, or the success ofLondon’s Olympic Games, any further. Annoyingly, I can’t get WordPress to align these two page images together (anyone out there who can help? ), but here’s a piece on the Olympics, which I’ve written for today’s Sunday Express. I’ve also done a couple of other pieces on Dow, which I’ll blog about in another post. FOUR years ago Prince Charles was handed a letter from a doughty heritage campaigner in London’s East End. The campaigner, a retired geog­raphy teacher named Tom Ridge, was asking for support in his battle to save an architecturally respected Edwardian sweet factory that had the misfortune to be ensnared within boundaries of the emerging Olympic park. King’s Yard, standing proudly by a canal and by then no longer home to Clarnico Creams but to artisans and furniture-makers, was a reminder of London’s past, a time when the Lower Lea Valley had powered the capital to industrial glory. In his letter, Mr Ridge told the Prince that Lord Coe and his Olympic team wanted to flatten it. In its place, they wanted an eco-friendly, wood-chip burning biomass boiler that would provide “sustainable fuel” to the stadia and the athletes’ village. Appalled, Mr Ridge had another idea: why not build the precious energy centre a little further away and save King’s Yard as a working industrial heritage centre? It would be a wonderful attraction for Olympic visitors, he said, juxtaposing the park’s modern buildings with London’s rich past. Unusually, the Prince authorised his private secretary to say he was “passionate about heritage”, that he was “sympathetic” to Mr Ridge’s campaign and he “wished him every success”. However, even that implied plea fell on deaf ears and the Olympic bulldozers flattened most of it. The demolition marked the last hope for those hoping the great 2012 project would include an element of what they called “soul”. Last week Lord Moynihan, the boss of the British Olympic Association, warned that the promised sporting legacy for schools from the Games had been “squandered”. As 2012 now looms, many wonder, especially those whose homes, allotments and football pitches have also been destroyed, whether Lord Coe will prove to be Britain’s most expensive con-artist. “What has Britain got for the bill of at least £10billion?” they ask. Certainly many Olympic officials have become rich, corporate sponsors are delighted with their front-row ticket allocations and thousands of police officers are salivating at lucrative overtime payments. However, while the area has undoubtedly gained in many respects, much has been lost. When Prince Charles’s sister, Princess Anne, stood in front of the International Olympic Committee in Singapore on July 6, 2005, she made reference to London’s Olympic bid document. That file had been prepared during the previous 24 months when “sustain­ability” had been the global buzzword. London 2012 was to be the “most sustainable Games ever” and “excellence without extravagance has become our mantra”, the bid boasted. Seven years on, the document, which said the budget for the Games would be £2.4billion, makes for fascinating reading. It is a file of grand promises made and then kept at great expense, both in money and to people’s lives, and of others since broken – words that were clearly spun and never to be fulfilled. In it, the Olympic visionaries boasted of a marathon route through the East End, thousands of jobs for locals, construction materials transported by canals, wind turbines, cheap hotels, a “London Olympic Institute” and even an ocean-going clipper known as the “Olympic Friend-ship” that would sail the world promoting Britain’s name. None of this has really materialised. A search for the “London Olympic Institute” on the London 2012 website returns no results; the Olympic Friend-ship, which had been due to sail with young volunteers and berth at the Cannes Film Festival, was ditched in 2007. Plans for the Olympic wind turbine, which was dubbed the Angel of Leyton, were dropped last year because there would not be enough wind and after £991,000 had been handed to energy giant EDF. The promise that children born on December 20 (20/12) in 2004, the year the bid was submitted, would take part in the Opening Ceremony has also been broken. The organisers said 700 children were too many to accommodate. The historic East End, which had provided the 2005 delegation with its important “cultural diversity” backdrop, was also ditched this year when Lord Coe deemed the area too ugly and impractical for marathon athletes. The bid document said three-star hotels in London averaged £74 a night, four-stars £136 and five-stars £251. A search through hotel-finder websites suggests prices are double those next year. On jobs, Britain’s Olympic bosses have appeared uncomfortable. When questioned by a Commons select committee this month about the nationalities of workers on the Olympic site, 2012 chiefs admitted they had not been collating that information. Instead, Dennis Hone, the chief executive of the Olympic Delivery Authority, said: “About 25 per cent came from the local host boroughs.” But those who have been following the issue for the past few years were not hoodwinked: living in dormitories and temporary workers’ lodgings in local host boroughs is not the same as locals having the jobs. The bid document also sheds light on other Olympic myths. Games supporters now boast the Westfield shopping mall, which opened next to the park in September, was a direct consequence of the successful 2012 bid. However, the bid document reveals the opposite is the case. Lord Coe used the fact that Westfield and the associated Stratford City housing development was already to be built as a major attraction for the IOC. In fact, the entire Lower Lea Valley had already been earmarked for regeneration. There are some who believe the Olympics has actually ruined that planned regeneration. By fixing a date for the 2012 Games, reasonable objections and potentially more considerate planning decisions were over-ruled. The remediation of the site’s heavily contaminated soil would likely have taken more time and there, perhaps, would have been no need for the plastic sheet which is now buried just below the surface of the entire park. King’s Yard might well have survived, as might Manor Garden Allotments, built in 1900 by Churchill’s friend Major Arthur Villiers. That tranquil and fertile oasis for families was demolished for the Olympics, as was the Eastway Cycle Circuit. A co-operative housing development and university accommodation for 1,000 were also demolished. The site is now the basketball arena and athletes’ village.